In October of 1939 amid the turmoil of the outbreak of war Hitler ordered widespread “mercy killing” of the sick and disabled. Code named “Aktion T 4,” the Nazi euthanasia program to eliminate “life unworthy of life” at first focused on newborns and very young children. Midwives and doctors were required to register children up to age three who showed symptoms of mental retardation, physical deformity, or other symptoms included on a questionnaire from the Reich Health Ministry. A decision on whether to allow the child to live was then made by three medical experts solely on the basis of the questionnaire, without any examination and without reading any medical records. Each expert placed a + mark in red pencil or – mark in blue pencil under the term “treatment” on a special form. A red plus mark meant a decision to kill the child. A blue minus sign meant meant a decision against killing. Three plus symbols resulted in a euthanasia warrant being issued and the transfer of the child to a ‘Children’s Specialty Department’ for death by injection or gradual starvation. The decision had to be unanimous. In cases where the decision was not unanimous the child was kept under observation and another attempt would be made to get a unanimous decision. Questionnaires were then distributed to mental institutions, hospitals and other institutions caring for the chronically ill. Patients had to be reported if they suffered from schizophrenia, epilepsy, senile disorders, therapy resistant paralysis and syphilitic diseases, retardation, encephalitis, Huntington’s chorea and other neurological conditions, also those who had been continuously in institutions for at least 5 years, or were criminally insane, or did not posses German citizenship or were not of German or related blood, including Jews, Negroes, and Gypsies. At Brandenburg, a former prison was converted into a killing center where the first Nazi experimental gassings took place. The gas chambers were disguised as shower rooms, but were actually hermetically sealed chambers connected by pipes to cylinders of carbon monoxide. Patients were generally drugged before being led naked into the gas chamber. 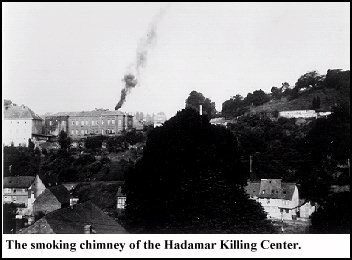 Each killing center included a crematorium where the bodies were taken for disposal. Families were then falsely told the cause of death was medical such as heart failure or pneumonia. As a result, on August 23, Hitler suspended Aktion T4, which had accounted for nearly a hundred thousand deaths by this time. The Nazis retaliated against the Bishop by beheading three parish priests who had distributed his sermon, but left the Bishop unharmed to avoid making him into a martyr. However, the Nazi euthanasia program quietly continued, but without the widespread gassings. Drugs and starvation were used instead and doctors were encouraged to decide in favor of death whenever euthanasia was being considered. The use of gas chambers at the euthanasia killing centers ultimately served as training centers for the SS. They used the technical knowledge and experience gained during the euthanasia program to construct huge killing centers at Auschwitz, Treblinka and other concentration camps in an attempt to exterminate the entire Jewish population of Europe. SS personnel from the euthanasia killing centers, notably Wirth, Franz Reichleitner and Franz Stangl later commanded extermination camps. via The History Place – World War II in Europe Timeline: October 1939 – Nazis Begin Euthanasia on Sick and Disabled. Obama is already on record as a Senator in Illinois for opposing legislation requiring medical care for babies that survived a botched abortion. He also flies drones around the world killing people at his whim.